Samual Duran in an older mugshot, and after the standoff. 32 year old California-born Samuel Nathan Duran was wanted on Parole violations and federal law enforcement agents were helping local police search for him. They had been looking for Duran for ten days. They eventually saw him riding his bike and in an attempt to apprehend Duran, he allegedly shot an ICE officer, which initiated the standoff. Witnesses stated that the ICE agent accidentally shot himself, an unemphasized detail which appeared at the bottom of a local press report. Duran first fled to his aunt's house, and then to another nearby home where a mother and child escaped out the back door. This is where Duran holed up in the standoff. A robot was sent into the home and at 12:30am on Saturday October 26, Duran surrendered and was checked out at a hospital before being booked into Placer County Jail. ABC News10 reported that Duran was clearly known to have been born in the U.S. This was not an immigration case: "Duran was born in Roseville and attended Oakmont High School but did not graduate." This incident involving Samuel "Sammy" Duran raises several important questions. Why was a Department of Homeland Security officer (the agency under which 'Immigration and Customs Enforcement' officers operate) assisting police searching for a known American-born citizen wanted on a parole violation? 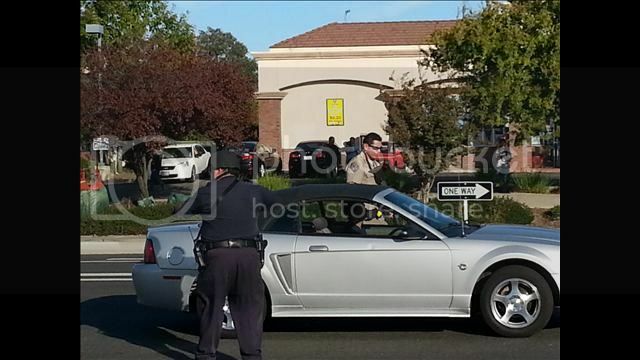 Why were feds on scene working with Roseville, CA police even before any shootout occurred? ABC 10 reported "The incident started around 3 p.m. Friday when Roseville police officers, working with an ICE agent, were checking on some apartments in the area of 6th Street and they saw Duran riding his bike. Roseville Police Chief Daniel Hanh said Duran was wanted for violating his parole and was a known/documented gang member." Further, why did the California Highway Patrol officer point a loaded weapon directly in the face of a witless motorist at a warrantless checkpoint? The AP caption read "A California Highway Patrol officer and another emergency responder stop a vehicle at a checkpoint near the neighborhood where a federal immigration officer was shot and three local police officers were wounded during a violent confrontation with a suspect in the Sacramento suburb of Roseville on Friday, Oct. 25, 2013. (AP Photo/The Sacramento Bee, Randall Benton)" Another photo (posted below) found in a slideshow shows the opposite view of the same car. Asked about the weapon used in the photo, Tom Davis, a retired NYPD officer, told LibertyFight "That is some form of a .223 "assault" rifle. By the way, the officer not only endangered this drivers life but also his own. We were taught not to use a rifle during a traffic stop for the simple reason that it's easy for someone to grab the barrel of the weapon. The proper way to approach a driver is from the back side (so he has to turn to talk to you) and with your pistol tucked into your side (if needed). Also, a .223 round when fired travels at app. 3,000 + feet per second. Had the officer fired from the position he was in, the driver would have no head and the fat cop on the passenger side of the vehicle would have a hole in his nut sack." Yahoo reported that a "federal immigration officer was shot in the leg as he and other officers made initial contact at about 3 p.m. Friday... During a later exchange of gunfire, after Duran fled, two Roseville police officers were hit by gunshots "one in the jaw and the other in the shoulder" and a third officer sustained shrapnel wounds from rounds that hit near them..."
Law enforcement officers had been looking for Duran in the area for at least 10 days before finding him on Friday afternoon, Walstad said. When they found him, Walstad added, he opened fire, wounding the federal immigration officer, who was on the scene to provide support for the Roseville police." An ABC NEWS10 article makes reference to '10 agencies' involved, but the title was later renamed to 'Roseville manhunt, standoff ends after 9 hours'. The original URL, however, retains the original title about ten agencies. Interestingly, the specific 'ten agencies' referred to in the title are never even listed. "A special agent with U.S. Immigration and Customs Enforcement's (ICE) Homeland Security Investigations (HSI) was shot Friday afternoon shortly after 3 p.m. while conducting a joint enforcement action with investigators from the police department in Roseville, Calif. The special agent was rushed to a local hospital where he is now reported to be stable and alert. Additional HSI agents are en route to the incident scene and will be assisting the Roseville Police Department with the ongoing investigation." "IT FELT LIKE it was a terrorist atttack! It felt like it was 9/11 in front of our house, it was crazy!" a local resident told the news. World Net Daily, a neocon site which fully endorses the false pretext of terrorist attacks carried out by Muslim boogeymen, and supports the military industrial aparatus and police state war machine, then capitalizes on scandalous stories such as this when opposition to the police state becomes more prevalent. Here is a slideshow with 50 more photos of the scene. The Roseville police posted their press conference on their website. (video below.) They also give updates on their twitter account. Two additional videos, of the half-hour police press conference and an interview with a neighbor, are below. LibertyFight asked The Roseville Police Department on their twitter account why they were working with DHS and federal agencies in the first place. As of yet, no response. @CityofRoseville Why were federal agencies including DHS working with your Dept. to find parole violators before the shootout even began? Below are some of the visitors who have logged on to this article: The City of Roseville, CA., the Dept. of Homeland Security, the U.S. Department of Defense Network Information Center. NOTE: To post this story on Facebook, use this link: http://whatreallyhappened.com/content/dhs-agent-reportedly-shot-himself-launching-military-siege-dhs-feds-assisted-local-police-fi. EXTENDED: Roseville officials briefed the media and public on what during Friday night's manhunt and standoff. During a news conference Saturday afternoon, Roseville police officials provided more details to what happened on Friday night. Martin Hill is a Catholic paleoconservative and civil rights advocate. His work has been featured in the Los Angeles Daily News, San Gabriel Valley Tribune, The Orange County Register, KNBC4 TV Los Angeles, The Press Enterprise, LewRockwell.com, WhatReallyHappened.com, Infowars.com, PrisonPlanet.com, Economic Policy Journal, FreedomsPhoenix, Haaretz, TMZ, Veterans Today, Jonathan Turley blog, The Dr. Katherine Albrecht Show, National Motorists Association, RomanCatholicReport.com, WorldNetDaily, AmericanFreePress.net, OverdriveOnline.com, Educate-Yourself.org, Dr. Kevin Barrett's Truth Jihad radio show, Strike-The-Root.com, ActivistPost.com, Los Angeles Catholic Lay Mission Newspaper, KFI AM 640, IamtheWitness.com, Redlands Daily Facts, BlackBoxVoting, The Michael Badnarik Show, The Wayne Madsen Report, Devvy.com, Rense.com, The Contra Costa Times, Pasadena Star News, Silicon Valley Mercury News, Long Beach Press Telegram, Inland Valley Daily Bulletin, L.A. Harbor Daily Breeze, CopBlock.org, DavidIcke.com, Whittier Daily News, KCLA FM Hollywood, The Fullerton Observer, Antiwar.com, From The Trenches World Report, and many others. Archives can be found at LibertyFight.com and DontWakeMeUp.Org.